Plot: On the Ice Planet Lexor two cities have fought ceaselessly for 10,000 years. Finally one side unveils Peron, a solider whose glaze destroys everything in his view. Peron quickly vanquishes all enemies and returns to his city a hero. The King bids him a private audience and unveils a gift to thank him for his prowess on the battle field. Shock: The King unveils a mirror and Peron cannot help but gaze into it and so destroys himself. The King congratulates himself on ridding the kingdom of a dangerous future challenger for power. Thoughts: A future shock with little to recommend it beyond the Machiavellian delight of the scurrilous King winning out. The script is utterly nonsensical – how does one train to have eyes that kill? At least X-men have the conceit of mutant genes whereas Peron simply ‘has trained for 20 years’ (and if you are investing in a 20 year training cycle surely you’d have more than one warrior on the program?). Peron goes to battle on an Ice planet, which presumably has lots of… ice. So no chance of catching your own reflection in the ice eh? Or on all that shiny metal work these bizarre future knights are dressed in. Good job the king had the only mirror too – otherwise a 20 year training program might have been for naught had Peron nipped into a public convenience and looked up when washing his hands. Add to this a surfeit of stupid fantasy names dropped hither and thither for little reason and Robert Flynn’s first Future Shock is deeply unimpressive. However even then there could no-doubt have been a market for it had the art been up to par but if anything the barely fan-art efforts, credited to Marzal Canos, is even worse than the script. It certainly ranks as the worst art in a Future Shock up to that point. 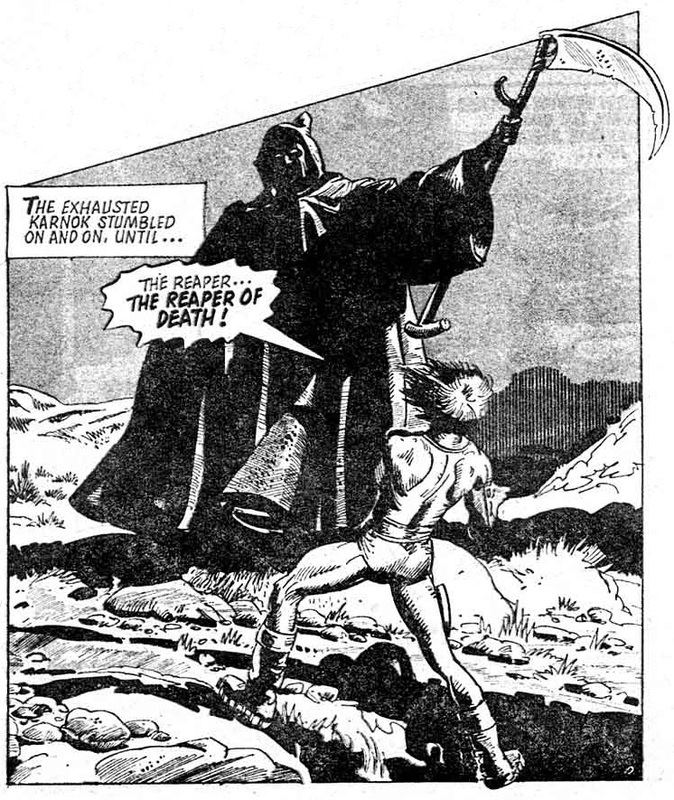 It’s hard to know whether Canos really can be the source of such inept work – he had already worked, at times with Lozano, on several 2000AD strips, notably MACH 1, and while that art was hardly astounding it certainly was competent and professionally done. This three page Shock has, at most, one panel that is of a professional standard, and even it isn’t much more than hacked-out. Whoever is responsible for this, or whatever division of pencils and inking may be behind it they certainly can view it as the nadir of their career. If it was Marzal Canos then it is at least fair to point out that he has gone on to far better work. Shock’d? The fate of Peron is a shock in that there has been no indication it has been coming nor is it in any way convincing or logical. 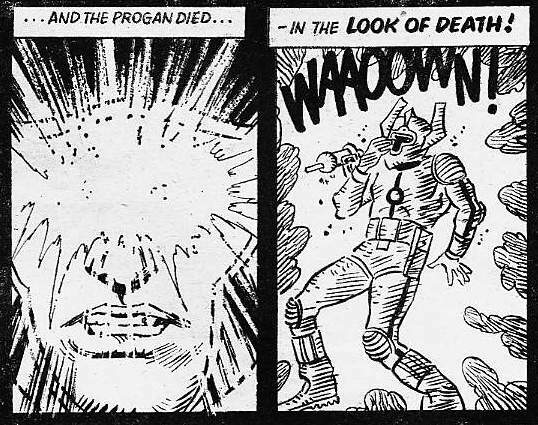 As may be clear the shock is in just how bad the art in this is in a Prog that featured the sumptuous work of Ian Gibson and Dave Gibbons.